The screen snap below shows a filtered product list from an example file. Each column heading shows the drop-down arrow on the right. In Excel, columns that have filters have the down-control arrow show as blue. 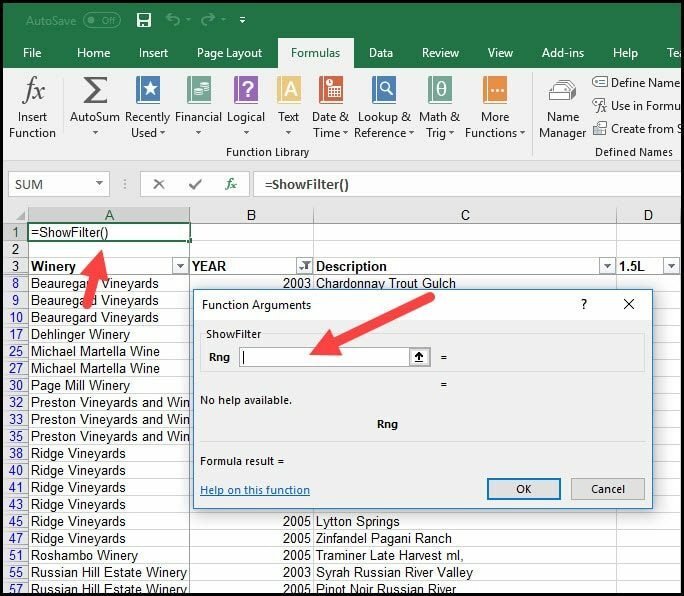 If you’re not familiar with this feature, you can review an earlier Excel AutoFilter tutorial. 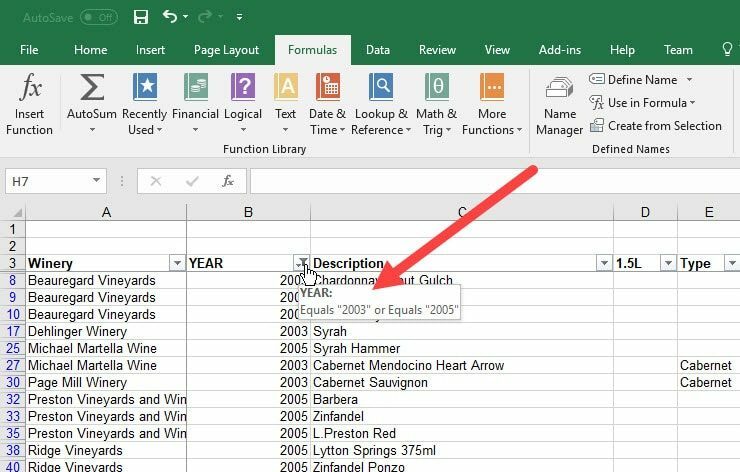 Excel makes it easier to identify a filtered column because it adds a small filter graphic to the drop-down arrow. If you place your mouse over the column heading you can see the filter criteria. On the first pass with my large spreadsheet, I clicked each column and wrote the column’s filter criteria. I soon learned I didn’t want to do that again and started looking for a better way. Like many problems, I thought someone smarter than me had solved this issue. The first person is a Microsoft Excel MVP named Stephen Bullen. 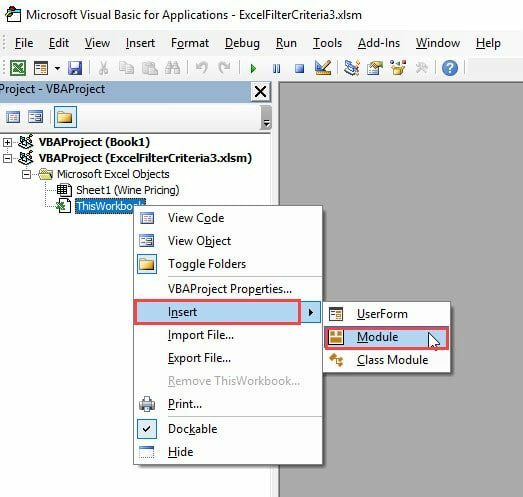 Mr. Bullen has written several books on VBA for Excel and has a website called Office Automation Ltd.
His solution was to add a user-defined function that reads the filter criteria for any cell. This allowed me to insert a function reference above each column so I could see my filter. If the column didn’t have a filter, nothing showed for that cell. This solution was elegant but static. For example, if I wanted to change the filter to include years 2003-2005, the top cell wouldn’t reflect this change. It could mislead the user. Fortunately, I found a workaround by Rob Markbram on his blog called Rob on Programming. He borrowed from Stephen Bullen’s code and appended the cell formula to force an update. But as often the case with software updates, what once worked in previous versions of Excel for me broke. However, I was able to find another solution from Bob Phillips on Microsoft TechNet. The result was I could see my filter criteria above my columns. This even worked if I used a word filter. 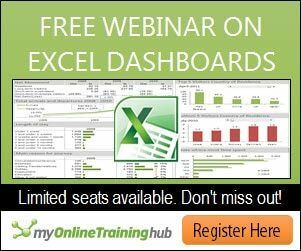 Open the Excel spreadsheet where you would like to add this function. Press Alt + F11. The Microsoft Visual Basic Editor should appear. You should now see a blank Code module on the right side. 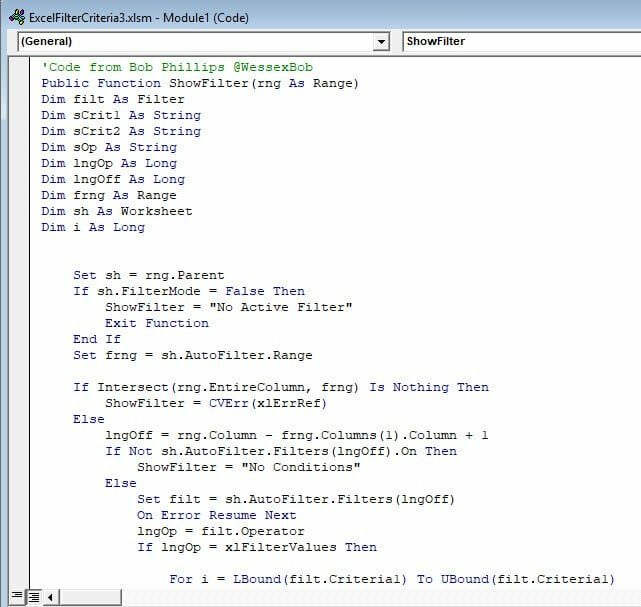 Copy Rob Phillip’s code below and paste into the new module. 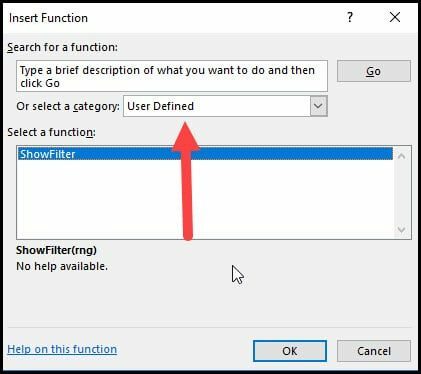 ShowFilter = "No Active Filter"
sCrit1 = sCrit1 & filt.Criteria1(i) & " or "
sOp = " And "
sOp = " or "
Notice how the new ShowFilter function shows in the top right. 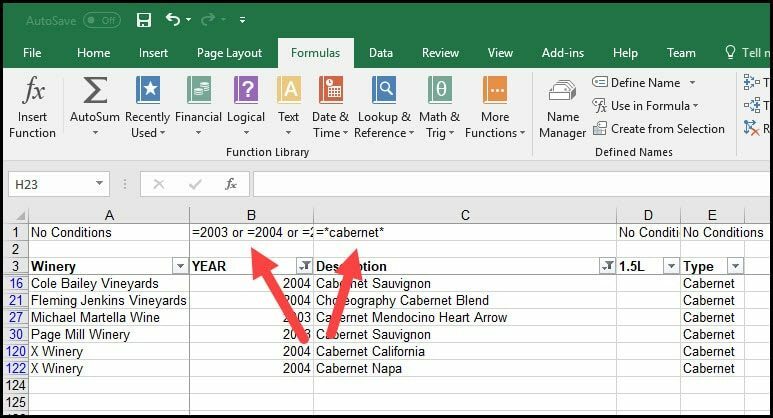 Click the Excel icon to return to your spreadsheet. 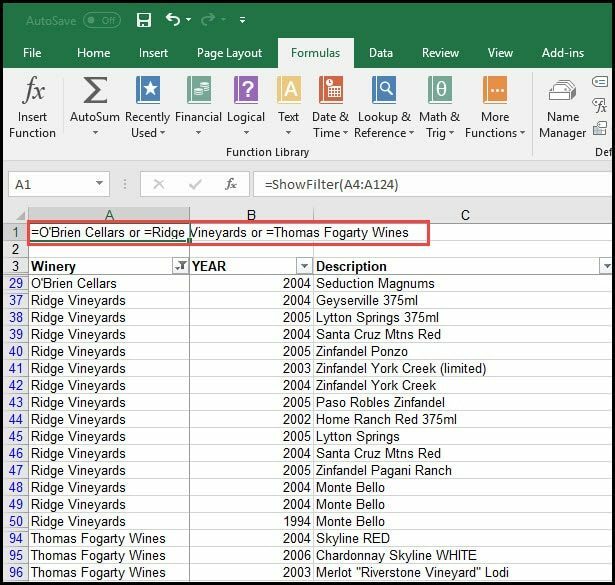 The next part is to insert the function into the cells on your worksheet. My preference is to show the filter criteria at the top so I inserted two blank rows. I also prefer to insert the function for all the columns even if I don’t plan to filter them. You can adjust your spreadsheet accordingly. Place your cursor in cell A1. In the Select a function: section, highlight ShowFilter. In the Function Arguments dialog, enter the cell range for your column. In my example the range is A4:A124. 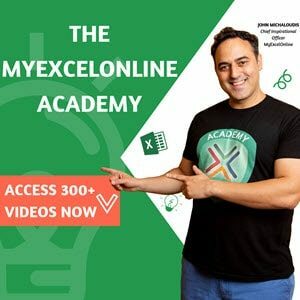 If you click cell A1 you should see your formula with the user-defined function. Because this column is not filtered, the cell displays No Active Filter. 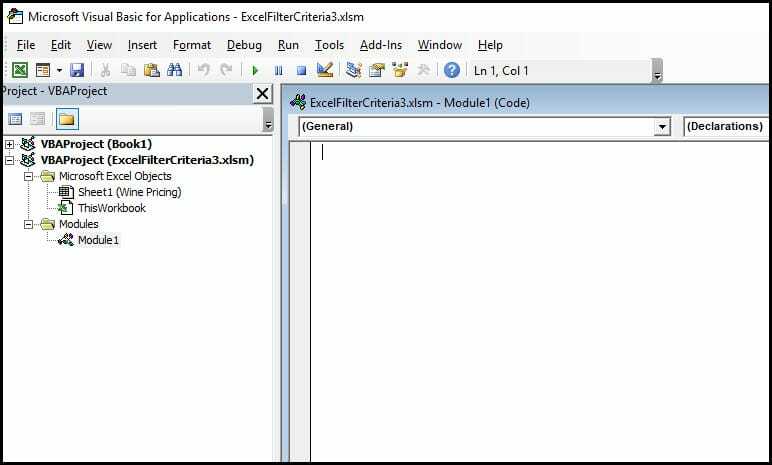 At this point, you should test the code by selecting and deselecting various items in the filter box. Repeat the process for any other columns.